Any researcher with funding from the Wellcome Trust, a global biomedical research charity that supports thousands of researchers, can receive more support to practice open research as a part of a pilot project with Springer Nature’s Research Data Support service that launches today. Our Research Data Support service aims to help solve problems researchers have in sharing their research data, the most common of which, researchers have told us, is being able to organise data in a presentable and useful way. As well as this gap in skills or capacity to curate data, covering the costs of research data management and data sharing is another often unsolved problem. While research funder policies and provisions for data sharing continue to evolve, the questions of who can meet the costs of research data management, and how, are not always clear. This pilot with Wellcome Trust helps remove another barrier to data sharing as it enables any researcher who receives Wellcome funding, or who is affiliated to a Wellcome institute, to receive Springer Nature Research Data Support at no cost to the researcher. Research Data Support involves a professional Research Data Editor (curator) working with researchers to organise and share their data. The scope of the pilot is broad. Any previously unpublished files that have been generated as part of research, other than the research paper or manuscript, can be submitted to Research Data Support. Furthermore, qualifying researchers can utilise Research Data Support to share data that support any Wellcome-funded study being published in any peer-reviewed journal - not just journals published by Springer Nature. As a data deposition and curation service Research Data Support can complement, but does not substitute, the peer-review process by increasing accessibility of research data for editors and reviewers and, ultimately, readers - enabling reproducibility with increased transparency. When uploading datasets - which can include virtually unlimited numbers of files up to 50Gb in total combined size - to Research Data Support, researchers should identify their Wellcome funding or affiliation during submission. Researchers’ grant identifiers or Wellcome affiliation will be validated upon submission. 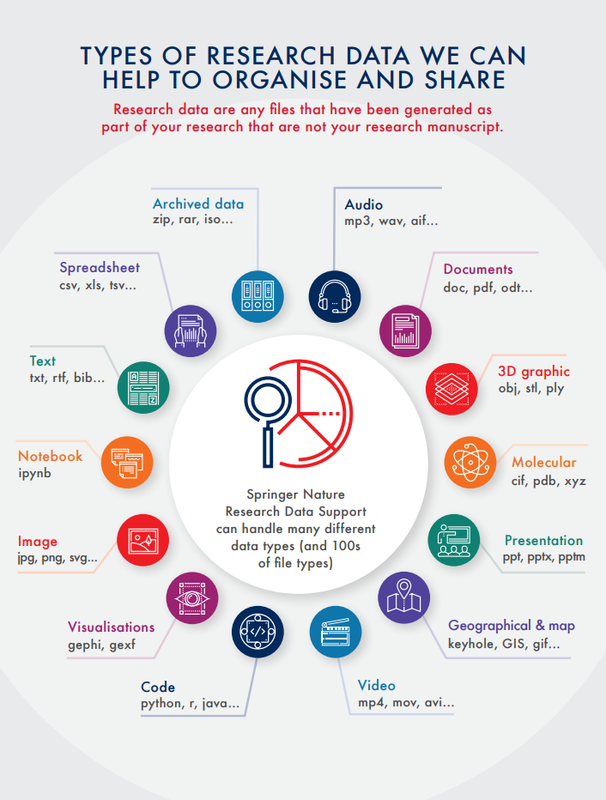 When datasets are published with Research Data Support they are findable and accessible and citable in the Springer Nature figshare repository, a general repository for a wide variety of data types that do not have a discipline specific (community) repository. To ensure we promote community best practices, Research Data Support also helps identify if a community data repository exists for a dataset, and in which case researchers will be directed, preferentially, to that resource. Our large survey of researchers also found that usage of community repositories and awareness of mandates for data sharing could be improved. All researchers can continue to receive free advice from the Springer Nature Research Data Support helpdesk to find suitable repositories and comply with data policies, if they do not need hands-on assistance from a research data professional. Research Data Support will also enable Wellcome grantees, if they need help, to meet the requirements of Wellcome’s leading funder policy on data, software and materials sharing. While policy is important, successful open research - a means to more reproducible, and efficient research - requires action. This pilot, which we anticipate running for six to 12 months, should provide easier access to resources that enable open research to be put into practice. Wellcome-funded and all other researchers can access Research Data Support from this enquiry form, or from the submission system of an integrated journal. A dedicated support page for authors and librarians for this Wellcome pilot is here.